Is Your Pond Ready For The Fall Season? 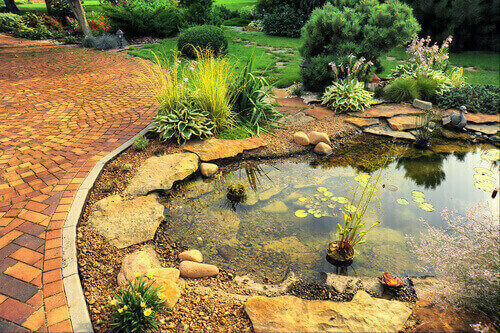 Home > Blog > Pond Tips & Tricks > Is Your Pond Ready For The Fall Season? Fall can be a hazardous season for ponds when they are not properly maintained. Falling temperatures and leaves are just a few of the problems pond owners will face, so it is important to remember these fall pond care tips to ensure your pond remains in a pristine condition throughout this season. Decaying organic matter that is allowed to accumulate at the bottom of ponds will result in the release of toxic gases. If your pond contains fish, frogs or other animals they can be harmed by this. The water quality will also deteriorate rapidly, becoming green and swampy. While it isn’t necessary to remove every leaf or twig you will need to eliminate the majority of them. This can be done with a pond net that has a long handle which allows you to scoop the debris out. Be sure to get rid of leaves that are caught in the skimmer basket. Pond netting is a necessity during fall because of the increase in falling leaves and debris. Even if there are no trees near your pond wind can carry leaves over considerable distances, and the netting can also prevent grass and plants from falling into the water. Using pond netting will make your task easier because all you have to do is roll up the leaves, grass and plants it catches then discard them and reinstall the netting. It’s that simple! When temperatures fall you will want to prepare the pond water. The best way to do this is through adding bacteria which is beneficial and adapted to low water temperatures. After the temperature in the water falls to fifty degrees or below you will want to add this bacteria two times a week for two weeks, and then once each week until the water begins freezing. Many pond owners fertilize their aquatic plants once frost appears for the first time, but this should be avoided. It is essential for pond plants to be property maintained in preparation for fall. To do this you will first want to trim aquatic plants which are marginal yet hardy. They should be trimmed to 2” higher than the water so that the decaying foliage doesn’t reach inside the pond. The leaves of plants such as stems or water lilies should be trimmed to between 2” and 3” higher than the plant’s base, as this prevents decaying foliage from affecting the pond. When tough water lilies are left inside the pot, they should be placed in the deepest area of the pond so they can over winter. They should not be brought inside the home as they need time for dormancy. However, tropical water lilies can be brought indoors during fall and winter. The pot can be kept in water with a temperature of fifty degrees or the plants can be removed from the pot and placed within sand.